I couldn’t wait. I just couldn’t wait until my next trip home to get an Italian beef. Especially after I heard about a new place in Kalamazoo that specializes in the Chicago specialty. I was surfing the web the other night and came across a great website that lists some of the best restaurants all over SW Michigan, South Central Michigan, and Northern Indiana by city, cuisine, and specialty. There’s a blog that goes with the website that updates new places. That blog is where I found Ray Ray’s Italian Beef & Sausage. 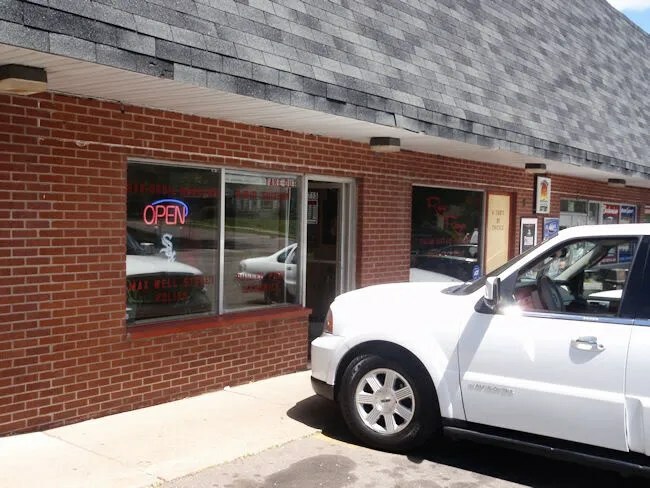 The very small restaurant is on Miller Road near Fulford Street in the Edison Neighborhood. There are no tables inside the store, but there is something that makes it very Chicago. A counter with stools. That set up is very common at sandwich shops in Chicago. It’s where the “hunch” was made famous. The decor is all Chicago. From a White Sox banner in the window to a huge picture of Michael Jordan to various skyline shots, every piece of art used in the place reminds you where you’re eating. The menu is all Chicago style food. Chicago dogs (with a big note that there is NO KETCHUP on the dog), Maxwell Street Polish, Italian beef, Italian sausage, BBQ pulled pork, BBQ chicken, Chicago Fire Chili, and burgers made with fresh ground chuck. There was no doubt about what I wanted. I went with the Plain Italian beef with hot giardinieria, an order of fresh cut fries, and a can of Coke. The owner was working the kitchen and was very chatty. There is an open window between the dining area and the kitchen and even though the order was written down, the cooks were talking to customers to get the orders right. The guy in front of me, who had never had an Italian combo was talked in to eating in because those type of sandwiches are not eat in the car food. My sandwich started with a flaky hoagie roll that I asked to be dipped in the gravy. It was then filled with sliced beef and a hot giardinieria mix. The sandwich was one big, messy pile of deliciousness. The bun was completely soaked which is how I prefer it. I was sitting at the counter when I started, but pushed the chair aside so I could get into the hunch. Basically, that means stepping about a foot back from the counter and leaning over with your elbows on the counter to eat. 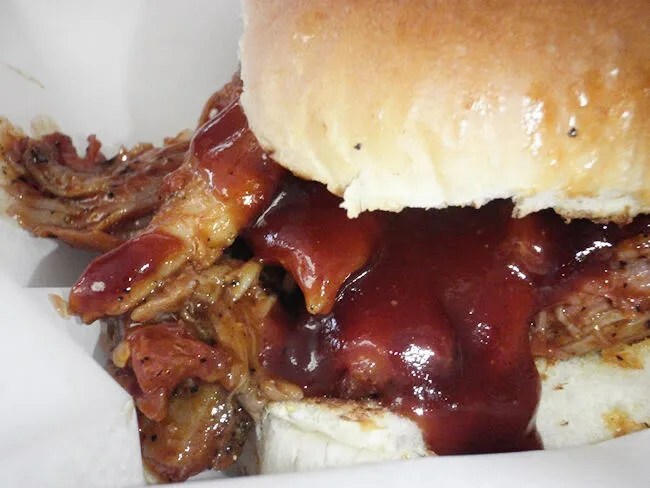 The sandwich is so messy and the hunch keeps your shirt from getting dirty from the dripping gravy. The owner was telling us he lived in Chicago for 20 years and owned a restaurant in Cicero. It showed. The Italian beef is incredibly authentic. The fries were also fantastic. They’re fresh cut and very greasy. 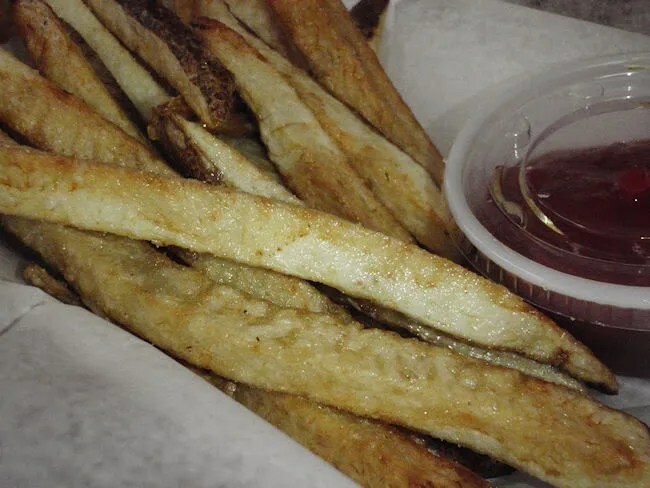 A perfect Chicago style fry. J and I both thought they were some of the best we’ve had in Kalamazoo and some of the best anywhere outside of the city. She gave me part of her sandwich because she was getting full and wanted to keep eating the fries. J ordered the pulled pork sandwich. It comes with the option of mild or hot sauce. J went with the mild. The pulled pork is hand pulled pork shoulder that was grilled over charcoal. The meat wasn’t pulled and sitting in a tray waiting somewhere. The cook actually picked up the pork and pulled it as he needed. The sandwich is served on a grilled hamburger bun which J really liked. It was kind of a knife and fork pulled pork. There was a lot of meat and a lot of sauce. The grilled bun held up well though and you still got the crunch even though it was soaked in a sweet, mild sauce. J really liked the sauce and the bun, but the meat was a little too thick for her. She likes pulled pork more shredded and these were big chunks of meat. She said it was really tasty, just not what she prefers. Like I mentioned though, she loved the fries. Our bill for these two humongous sandwiches was just a little over twelve bucks. That’s ridciulously cheap. In comparison, we don’t get out of Portillo’s for much less than $25 and my beef was much better than Portillo’s. 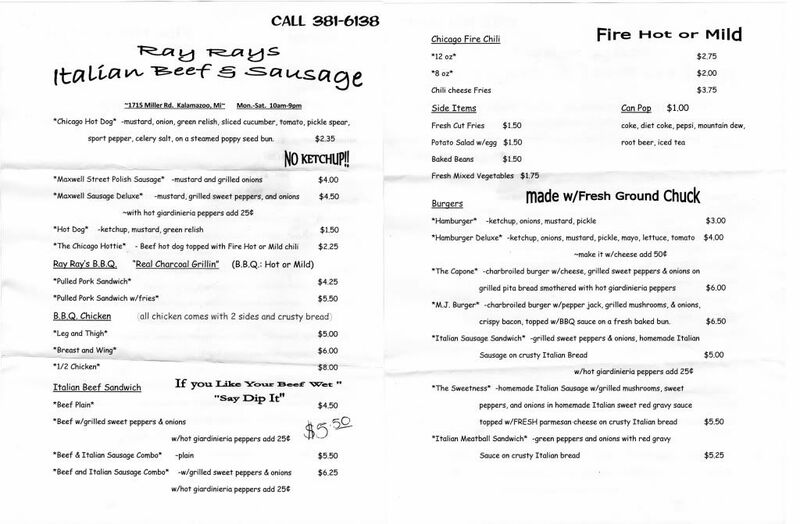 Ray Ray’s has only been open a few months, but even at 1:00, they were going through quite a few orders. There was a steady stream of people coming and going as we sat there eating our lunch. As Chicago transplants ourselves, we understand the owners desire to bring real Chicago food to Southwest Michigan. He said the reason he opened the place is because he was tired of making the drive to get a real Italian beef or Chicago-Style dog. 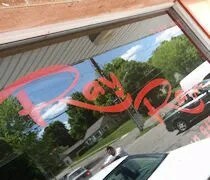 Ray Ray’s is the best place in Kalamazoo you’ve never heard of. If you want to try real Chicago style food, this is the place. Thanks for the tip! We went there tonight after I read about this. We’ve been wanting a place around here that served good Chicago dogs. It’s definitely a place I’ll be visiting again. Did you know that he went to( Mackenzies bakery )A local establishment to develope the bread that he uses to make his sandwhiches and crusty bread… He also goes to a local meat processor to get grade A meat to ensure that he has the best meat with out all the preservatives… Where else can you go for a wholesome meal For about $6 or $1 more for a drink? Watchout Mcdonalds who wants to pay $3 for a processed meal when for $6 you can have something that is actually good for you…If your wheat gluetin intolerant try the chicken dinner with the fresh veggies and beans…I’ve lost 10 lbs just cutting out the bread and carbs…He even uses all fresh herbs when making his veggies…It’s hard getting his cooking secrets out of him, but what he has told me has let me know that his is very health conscience… He seems to be very happy when his customers are happy, and when something gets messed up in the order believe me he makes it more than right, he’s so down to earth and family oriented it makes life in the neighborhood all good. So try it out and see if you don’t start craving the wonderful fresh flavors of the food… Enjoy!!! I tried to leave a comment on m.live and couldn’t…And yes the man who did a commentary on ray rays for the kalamazoo gazette really did a poor job… In my opinion he should have asked alot more questions…like where do you get all of your ingredients which should have been obvious questions to ask… why did he just focuse on what was going on that day? yes all family oriented bussiness do have things going on, but why didn’t he ask the obvious questions? what kind of ingredients do you use? How many of your items are kept fresh daily and how long do you keep your items… Do you buy your meats daily or weekly..These are important questions when we are thinking about our health… And the answer is yes to all of these items are bought on a weekly basis and are all fresh and are not processed as most local restaurants do… At the end of the week he told me that they throw everything out or give it away and start over again with all new fresh items… So in my opinion they are way under pricing the food that they are selling… I wish I was the one doing the interview for the Kalamazoo Gazzette…Because They where not thourough enough and mainly focused on the family dinamics which always has things to work on… It sounded more like the guy from the Gazzette was trying to imbarasse the family rather than embrace them on a family trying to make a living… When I go into ray rays everyone is working together and no one is having any problems… And yes the dad is giving orders but where do you go where everyone is having a good day?… I can’t imagine working in this kind of atmosphere I wouldn’t be able to handle the pressure…It’s at least 120 degrees by the stove/oven so you can’t have an air conditioner, cause all the heat would go up and out the air vent… So what are you suppossed to do? All I know is the food is good and so is the actions from the people who work there… So go and try it out and see if it doesn’t feel like being at home… enjoy!!! I have been there once, but plan on going back soon. I have talk with others about the restaurant. Strongly recommend the the food. I am very happy to find this opportunity to enjoy good food especially the atmosphere. I’ve had the best beef in chicago and nothing tops mr beef in chicago until I happen to stop by rayrays to check out this beef. Me and my wife were laughing before we walked inside like ya right this is chicago beef in a stupid towm of kalamaZoo mich. 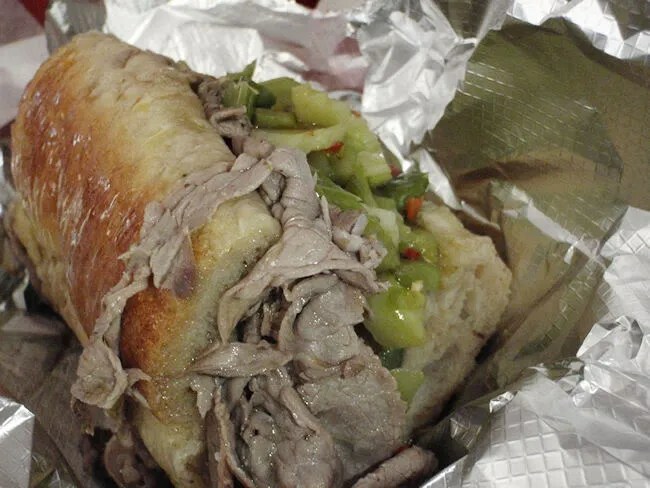 When I first put this beef in my mouth,I got chills and goose bumps which I never ever gotten from eating an italian beef,my mouth drench and even as I’m talking about this now and responding to this article,I’m drulling again for rayrays beef. This is by far the best beef in the world. It blows away mr beef and every beef place in chicago. And as for being in kalamazoo,mich. Beautiful area as well. Ill never judge a place ever again. People pray that this owner robert gutierrez opens up million of rayrays accross the world. Come to find out roberts nephew ryan gutierrez who lives in berywn,I’ll owns a redesign furniture store in maywood,I’ll and he was on the oprah winfrey show about 20 times. Great designs and prices. Somethin runs good in this family to run great businesses. stupid town of kalamaZoo? you r right don’t judge a place…. i was born in Berwyn, lived in Tinley Park and Hinsdale.. crave chicago hot dogs and italian beefs also… sigh… yes … White Castles… great to know a great place to go…. i will be there! IF I WAS TO DIE OF A HEART ATTACK, I HOPE IM EATING ONE OF THERE BEEFS RIGHT THERE IN THE RESTURANT. We’re Chicago area natives and although we love SW Michigan, we sure do miss “real food”. We’ve tried a number of items on the menu and loved everything we’ve had so far. Since we found Ray Rays we’ve been visiting a few times a week. We have even gotten our co-workers to try it and they love it too. Keep up the good work! And thanks for bringing “real food” to Kalamazoo! My favorite was the sausage and beef combo. Amazing. Truly amazing. What the OP failed to mention (I think) was that each item – especially the sandwiches, were very well wrapped. This is for obvious reasons, as the food is very juicy and messy. As it should be. I think the place just makes you happy when you go in. People standing in line with you must stare at the food being prepared and just get all gooey inside. Now I must go back. I should not have written this on an empty stomach.